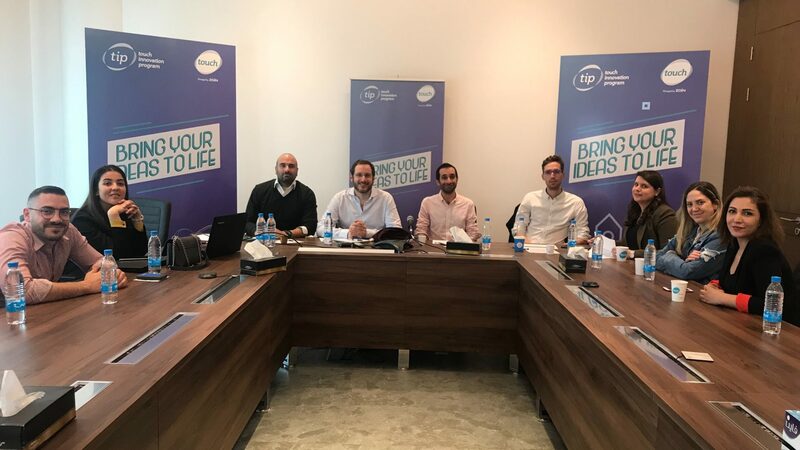 As the 2nd cycle nears its end, the touch Innovation Program (TIP) eagerly held a new pitching round session on the 5th of April at touch HQ, where 11 semi-finalists took the stage hoping to join the anticipated 3rd cycle. The semi-finalists pitched their products/services to a renowned panel of judges consisting of Alexandre Hawath, Investment officer at IM Capital; Fawzi Rahal, Managing Director of Flat6Labs Beirut; Omar Christidis, CEO of Arabnet; Nadim Khatar, COO of touch; and Lara Ammar, Digital & Innovation Senior Specialist at touch. After careful deliberations, the judges selected 6 promising startups to represent the new and improved TIP cycle. Joining these 6 innovators is the Agrytech startup IoTree which has been awarded a golden pass from touch during the 1st Agri-Food Innovation Day for its disruptive solution. The 18th of April marks the closing day for TIP’s 2nd cycle and will introduce cycle 3 participants marking its beginning. Cycle 3 promises to stand out from previous ones with better integration between startups and mentors, further exposure and networking opportunities, as well as the introduction of new programs! CloudSale supplies the HoReCa businesses with all their non-food related needs. Businesses can buy locally sourced items such as cups, plates, cutlery, consumables, and equipment easily, efficiently, and transparently, and have them delivered within 3 business days. Live Love Recycle is a new social and environmental project that helps counter the garbage crisis in Lebanon. It is a collection service based on a mobile app where, with just a few taps, citizens can request a pick-up for their recyclables. A driver on an e-bike will be at their door within 30 minutes to collect the bags and drop them at local recycling centers. Cherpa is an interactive online environment for teaching robotics courses to youth. The platform offers guidance for their students on learning Robotics to eventually reach the Peak and become Inventors on their own. Startup Battle Beirut 2019 3rd place winner, BlocRecs, is a blockchain-based platform with a mission to end degree fraud. We allow universities to securely issue their degrees on the blockchain. As a result, students can digitally share their degrees and employers can instantly verify them. Spike is a mobile assistant that helps diabetics better manage their diabetes. It monitors the patient’s daily behavior and jumps in with reminders and tips when needed about insulin, food, activity, etc. Additionally, Spike stores the patient’s data for further analysis and/or sharing with doctors and caregivers. They have won the Seedstars Beirut Competition and placed 1st runner-up at the Ideas Track during MITEF’s 11th edition of Arab Startup Competition. MITEF Pan Arab Alumni Zima is a software platform that helps small community ISPs manage their internet like a big ISP by providing them with the same grade of tools for a fraction of the cost. Zima is different by being cloud-based and just takes 2 minutes to set up. Other systems require hardware installation and a lot of time get started. The Zima team has been working on Zima cloud for the past 2 years and they have secured a happy user base in the UK, Ireland, USA, India, Pakistan, South Africa and Lebanon. IOTree is a smart wireless network of smart traps that are developed using a deep learning algorithm and machine vision designed for the early detection, classification, and counting of different types of harmful pests. Farmers can benefit from the IOTree app by receiving real-time reports and updates via SMS or mobile application on the best agricultural practices to deal with pest invasions.